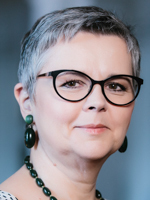 Born 1957 in Graz, Dr. Dworczak has been Associate Professor of Organic Chemistry since 2002 and has acquired additional know-how in human resource-related issues during her work in the Study Group for Affirmative Action for Women, which she chaired until 2007. In her research she focuses on the chemistry of renewable resources. Dr. Dworczak has been Vice-Rector for Human Resources, Human Resource Development and Affirmative Action for Women since 2007. During her period as Vice-Rector, a collective employment agreement for university staff was introduced and numerous other employment agreements, such as the establishment of a pension scheme, were finalised. She has also dealt with other important issues like the implementation of training and advanced training schemes for employees, as well as special affirmative action programs for women.